The most meticulously updated and accurately crafted minimal social media icons on the internet. Now includes the new Instagram icon! Okay fine, I’ve got more than one of them. One in particular has to do with social media icons. It may be silly, but I just can’t stand seeing outdated social media icons. It bothers me–and I’ll talk about why it should bother you as well further in this post. However, in an attempt to save the world from outdated social media icons I’ve created my own social media icon set and you can download them for free! Not only that, but I’ve not got a bonus set of icons thanks to my friends over at Vecteezy who have created an additional set of social media-related icons just for my audience. And they’re all one-hundred percent free! So before I give you the goods, allow me to explain why this is actually such a big deal if you’re trying to make your mark online. In a world where visual appeal is associated with authority and credibility, it never ceases to amaze me how many times I come upon outdated, ugly social media icons. I’ve stated before how important it is to make your social media presence prominent. Your readers, customers, fans, and followers need to know that you are active on the social networks they would follow you on. While this may or may not be true, the impression that it gives is negative. No matter how awesome you are on those platforms, a savvy user (the people you want on your side) will recognize an outdated icon right away. Now, the goal is not to make fun of these people, businesses or brands, but to raise awareness that it’s time for an update. I know, I know– total first world problem, right? Well, honestly, some of these businesses or brands simply don’t know that the icons are outdated. What’s worse is that they don’t realize that most Twitter users don’t even know what that old lower-case “t” icon is. Most often, it’s the Twitter and Google+ icons that are messing everything up, with the occasional old Stumble Upon icon. So be on the lookout for those usual suspects. Updated Social Media Icons FTW! 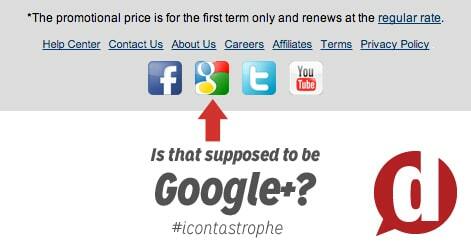 Whether it’s a blog, business site, or just a cool infographic, one outdated social icon can totally ruin it. I can understand though that it’s not easy to stay on top with how often some of these sites change their icons. So I’ve made it my goal to not only keep myself updated but to help keep you updated as well. For me, this is one of those small details that can communicate volumes about your digital presence. Staying on the cutting edge keeps you relevant, reinforces trust, and helps you achieve social media rockstar status. If you’re going to build and design a blog worth following it is essential that your social media links are both visible and current. That’s why I created this free icon set for you to download and use at your leisure. I’ve hand-picked the most popular social media networks and apps and created six different styles. I’ve created a square icon version and a minimalistic (isolated) version (without the square). Both versions come with 3 different color schemes (color, black, and white). Additionally, I’ve created them in .png at 32×32 pixels and also included the vector versions for those of you who want to scale them up or down as needed. 6 sets of 19 icons, that’s a total of 114 free social media icons that I’ve created for you! Needless to say, it took some time to craft all of these. Being a full-time husband and daddy, I just can’t maintain icons for every single site out there. However, I am open to requests if you have any specific icons you’d like for your set– just leave them in the comments below. The goal is to stay as current and accurate to each social network as possible to ensure brand consistency but also have a uniform look and feel. I will be keeping these social icons as current as possible. Every time one of these social networks changes its icon– you can bet I’ll be updating these sets as soon as possible. Bonus Icons for Your Graphics Needs! As I said previously, the good folks over at Vecteezy have agreed to create a special set of social media related icons for my audience! These are exclusive Dustn.tv graphics that you are free to use on any and all of your projects! There are 35 icons in total, and they come in .ai, .eps, .png, and .svg formats. Wah-hoo! Just add your email below, and you can download this free social icon set instantly! You are only entering your email so I can notify you whenever there is an update of this icon set. By adding your email, you also get access to my growing library of downloadable resources for all your social media and online marketing needs. You may also be interested in downloading my free official social media logos for larger scale use. That resource includes high-resolution versions of official social network logos for when a 32x32px icon isn’t enough. Included in this most recent update were some updates, one new addition, and several removals of social networks that are no longer with us. Medium updated their company logo (again) and so I definitely wanted to include that in the new mix. VK, the popular Russian social network has been added to the list by popular demand. With nearly 100M users worldwide, it was definitely time to add it to my free icon set. As always, I’ll be sure to keep an eye out for any network updates, changes, or shutdowns. As long as you stay subscribed to the email list, you will always be in the know! Are there any sites that you think I should have included in the set? You can leave a comment by clicking here. Thank you so much for this, great article, and great icon set. Can you please include logo of the TripAdvisor? Is TripAdvisor a social network? Would have loved one for linking to an organisation’s website, as well! (A “world wide web” or “link” or even “home” styled icon.) But it’s a great set with all of the essentials – thanks for creating & sharing! The biggest change for 2017? I think we’ll see more emphasis on live interaction. As far as tumblr goes, I’ve never developed a strategy dedicated to referral traffic from that channel. My first question though is, why Tumblr? Great job to be done. Keep it up and do more special. My site is not yet up, but scrolling through your blog has me finally feeling ready for my launch! Thanks so much, Dustin! You’re welcome! Best of luck with the launch! Thanks for providing all of these logos for our access. This is a great resource. I have a question, though. You mentioned (and show) the new Google+ icons are in sans serif font and the G+ icon being uppercase on red. When I downloaded the logo pack for Google+, all were in serif font and the g+ logo was lowercase. I am confused as I thought the new logo was sans serif and uppercase for G+? I just wanted to clarify. Thank you again. Hi Chandler! Thanks for pointing this out. It may be that I had a caching issue and the newest file was not being accessed. I’ll look into this. In the meantime, I’ve tried entering my own email above and clicking the download button and I seem to have gotten the correct file. Can you try again? Maybe clear all your browser caches first? Hey, I think I’m not getting the correct file, some icons are missing (like snapchat) and the Medium icon is just an M, not the actual Logo. Hmm… that’s interesting Cecillia. Sorry about that. Perhaps it’s due to caching… Give it another try! I’m going to send out an email to everyone who has already subscribed just to make sure everyone has the proper download link. So if you’ve signed up, you should get that email. I entered my email to subscribe to the insiders list but I haven’t received a download for the social media icons! Is there any way you could send them to me? Thanks! Hi Ken! Once you submit the form, there should be a download button that appears right inside the page. Try submitting again and wait for the page to reveal the download. I’m assuming the form you filled out was the one after the end of the post– that subscribes you to my Insiders list where you should actually get a confirmation email and then a “Welcome” email giving you full access to ALL my downloadables. Check your spam if you haven’t received that one. Of the thousands of times these files have been downloaded now, I’ve never heard of anyone having any trouble. What type of device is your laptop? What operating system? Snapchat icon would be cool. It would be nice if you could include the current Deviant Art icon and WordPress as well. I’ve been trying to find the updated Deviant Art icon and most everyone has the old one. Yes, I was aware of that the day they announced it. I’m still waiting on them to produce some sort of official branding guide so I can determine what the solid color version is supposed to look like. Being that my set is focused on a uniform flat look, I’ll need to see what theirs looks like. Ref: your icons – perhaps a Skype icon might be good ? I didn’t see a Skype icon in your download pack. Really Amazing that you can do this for the public and free of charge!! Thanks a million for doing what you do! I feel like I’m being a dunce, but I’ve signed up for the insider’s list, and I still can’t figure out how to download the vector versions. Could you point me in the right direction, or am I waiting for an email? Thanks for this great resources as well! I can’t believe how difficult it is to find correct vectors of these icons. Hi Jessica! When you sign up for the Insiders list you receive an email within minutes from my email address welcoming you to the list. That email gives you the link to the downloads page along with the password to access the content on it. If you didn’t get the email, maybe check your spam folder as sometimes those emails get flagged. I do still feel like a dunce, because that was exactly the problem. Found the email and excited to check out these resources and follow your updates! Thanks again! I keep waiting for some of these icon sets to have one for the You Version Bible app now that they have the “friend” feature. If you add one, please let me know! In case you haven’t checked it out, it’s at bible.com . What a great icon set, Dustin! And very generous of you to give it away for free. I just joined your mailing list so I can get updates whenever you update these icons. I’m Roukaya Said, community manager at the Departemental council of Mayotte in Paris. Traveller and dreamer, for me travelling brings the best out of myself to become a better person everyday. Well thank you very much for your insight and the offer of the social media icon set. I would suggest to add on the set if you would be interrested in the asian market. Particularly the South East of Asia. Firstly, I would add the Wechat/Wexin ( chinese messenger) icon. Because literally everyone on Asia have an account in it and so does the asian diaspora on the international scale. Secondly, Line App would be as great as Wechat another messaging apps which relay the information about music trends, stars and have awesome emoticons. It does reach Japan, Malaysia, South Korea and Taiwan, Hong Kong, Macau users. Thirdly, I would add Kakaotalk icon because, everyone on South Korean and the korean diaspora abroad use this korean app to communicate with each other. Particularly filled with cute emoticons and strongly linked to the Kpop wave. It’s a must have for anyone living in South korea. Finally, especially for the korean market, the application Naver could be relevant to use , because it the first search motor of the local population in Korea. Google is present on the mind of users but less used because Naver use national langage whereas google lack a litlle bit in that area. Your articles are so releavant and filled with ideas. These are great, and I love the simplicity! One thing I would love to see is high res versions of these. Maybe at least 256px or even vector files would be awesome! Right now it’s very limited because of the small size. Just a thought. Thanks! Hey thanks Trevor! You mean high res like these ones right here? Not all networks are represented, but it’s at least a start. Love these! Would love to see one for Goodreads. I just wanted to Thank you for creating the set of the Social Icons! Reason being, I use Canva pretty often (daily basis to be exact) and for what ever reason finding Social Icons became a pain…. Hi Anna! You’re so very welcome! You may also find my Official Social Media Logos post (and downloadables) useful! 😉 And you can always contact me here. Hi! Was linked here by MarketingJesus.net – thanks for the icon set!! Thanks again, looking forward to more in my inbox form now on. Thanks a million. These are clean. Really appreciate your blog and advice. Cheers. This might be a silly question… but I am trying to place these into an illustrator file and they are very pixellated. Why is that? Good question Rachel! It’s because these are .pngs saved at 32×32 pixels. If you’re taking them into Illustrator (which is vector based, not pixel based) then they’re going to look pixelated). If you want to avoid pixelation you’ll want to keep them at the set size or make them smaller. If you stretch them in any way though, they will become pixelated. Hi, great set of icons. I was wondering if you would consider adding Snapchat? Ugh, I hate Snapchat. I will consider it though for this next release. Love the social sharing you have on the posts. Which plugin is that? Thanks Web Design Fact! The plugin is one of my own design – Social Warfare. Let me know if you need any help Peg! Good looking social media buttons and thank you for providing them! thanks for the icons Dustin! its hard to find proper icons elsewhere. glad you took the time to design these! I love hearing from you and I have been watching you via HOA’s mostly through our mutual friend, Mia Voss. Hope your weekend is fabulous and thanks also for the clear direction on blogging, as always. Okay one other idea. I use both my Facebook profile and page and would like to have links to both without using the same icon twice. Not sure how to do that but it would be awesome to have! I would love to see a My Fitness Pal icon. Admittedly not EVERYONE would use this one but there are a fair number of bloggers who share their dietary and fitness journeys on their blogs. It would be awesome to have a quick way to share those pursuits with others. And personally I really like Rebel Mouse and would add their icon. The only other one that I can think of, off the top of my head, is StumbleUpon. Not sure if that is a good idea or not. I am just beginning to use SU. Thanks so much for the lovely set of icons! THis are awesome! thank you so much! Thank you, so much for the Icons Dustin they are really pretty. I adore this set! When you posted an update to them I couldn’t wait to get hold of the new icons, however, sadly when I download the pack none of the updates are included. I am now wondering if I did something wrong? Hmmm… Caching issue maybe. Let me check. Yep! It worked soon after. Thanks! Hey Dustin, great work. I’m surprised you didn’t squish these together into a sprite, but I took care of that. Thanks for the time it takes to craft a nice set like this. I have started using Mobli over Instagram lately. I would love to see a Mobli icon. Interesting. I’ll look it up. Any chance of now adding a Github or Dribbble icon Dustin? I will take that into consideration for the next release! This is a great set and thank you for creating it BUUUUTTT is there a way you could have an illustrator set to download? One wish: An icon for a website. While this may not make sense in the first thought, there is a reason behind it: this would allow somebody to use your icons also on other sites like tumblr (to link back to the real webpage, many people have a side tumblr). Soundcloud is a good idea, as they have a heavy usage with people who are producer mindset = also likely to be on many different plattforms. Not only the musicians but also the people who use it for spoken words or sound recordings. Along those lines an itunes icon for those podcasters would be great. If you like to make it more versatile (and even encourage more businesses to discover you) a foursquare icon would be great – along side a link in the menu to ‘hire me’. While there are many other options out there, those are actually the major networks to look through. 😉 Thanks again for the icons! Thanks Nicole! Those are some great ideas! What do you teach? Dude you rock! I love them. I recently spent like an hour going through iconfinder.com to find updated cool social media icons and they all sucked. How about Soundcloud? Thanks for the icons, they look great. I will keep that in mind for the next update! You’re not the first to ask. Thanks Josh! You should make a Soundcloud icon! I will consider it. Are you pretty active there? Very, it is how I find most of my websites music. Awesome. I’ve never really explored it much. I’ll keep it in mind for the next update! Hey Dustin, awesome work and i like your logo as well. Will most deff be a subscriber. I just converted over to the Standard Theme and are using your buttons. These buttons look great, thank you for sharing! Could you make a Pinterest and Instagram icon please? Instagram now have online profiles and pinterest has grown a lot! You know what… I think it is time to add those two to the set. Thanks for the nudge Razzle! Do you know how to add Stumbleupon to Standard theme at the top? Do you mean a StumbleUpon Sharer? Or just a link to a StumbleUpon profile? And I saw you link to this page in your latest post 🙂 Good job! Haha! Very cool indeed! Thank you for the compliments! Is there any other icon you would like to see added? Lovely icons, thank you! Would Pinterest be an appropriate addition to your icon set? It is definitely a popular network… never really worked into my personal online strategy… yet. Thanks for the suggestion– that will definitely be my next addition to the set! Great Stuff Dustin! Really enjoy these! I’m Glad you like them Stephen! Awesome! I will try to use these on my site. What about Instagram? Is there a way to direct people to your instagram? That social network is becoming really popular! Currently, Instagram doesn’t have a way to access people’s profiles on the web. You have to be in the app to find people. And I agree… Instagram is awesome! Great idea. How about an icon for my blog – the Stretched blog? Just kidding – sort of. I’ve been thinking about working with someone to come up with a logo for my blog. How do you think your logo has helped to expand your platform? Well John, I do actually offer brand identity and logo design, but I’m pretty booked up. I’m trying to formulate something for people in your shoes that would be practical and highly effective for a blogger… Still working on it though. As far as your question goes, I think it has definitely helped solidify my brand image in a number of ways. I’ve also gotten a lot more requests for logo design and brand identity because of it.